Our reds are ready for blending and we need you to help us determine the blend for the Raffaldini Grande Riserva! Each session is a two-hour education wine experience led by Owner Jay Raffaldini in our winery barrel room. Each blend you create will be carefully analyzed, sampled and help inspire our new vintage of Grande Riserva. This is an opportunity to hone your winemaking knowledge and ability, learn more about grape varietals, and make a few new friends in the process. Blending trials will be held in the barrel room allowing you to experience the winery during the winemaking session. Our reds are ready for blending and we need you to help us determine the blend for the Raffaldini Grande Riserva! 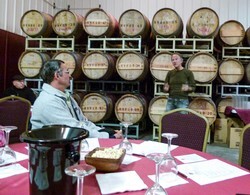 Each session is a two-hour education wine experience led by Owner and Jay Raffaldini in our winery barrel room. Each blend you create will be carefully analyzed, sampled and help inspire our new vintage of Grande Riserva. Our reds are ready for blending and we need you to help us determine the blend for the Raffaldini Grande Riserva! Each session is a two-hour education wine experience led by Owner and Winemaker Jay Raffaldini in our winery barrel room. Each blend you create will be carefully analyzed, sampled and help inspire our new vintage of Grande Riserva. Come celebrate Easter and the return of Spring at Raffaldini Vineyards. Bring the whole family and feast together over an Italian-style buffet brunch. An Easter egg hunt for the kids will take place on the lawn following brunch at 2:30pm. Easter Brunch tickets for those under 21 are $25 plus tax per person. Stop by the tasting room, visit our website www.raffaldini.com, call 336.526.1078 or email us at info@raffaldini.com for more information or to make a reservation.